According to a staff report from the Fairbanks Daily News-Miner “Rep. Tammie Wilson says state better equipped to enforce air quality” 2/3/2011. We may be feeling some whiplash, but we’re positive State action was due on the Steese coal smoker. Last night, Jan. 27, 2011, over 30 residents of the Fairbanks North Star Borough testified for the local clean air code 2010-28, opposing a weakening proposal submitted to the Assembly by Mayor Luke Hopkins, 2011-03, draft version 1/13/2011. The FDNM staff writer Molly Rettig mrettig@newsminer.com wrote about the public testimony and its outcome, “Fairbanks borough follows ballot measure, weakens air quality regulations” 1/28/2011. After considering public need for clean air as expressed by the smoke-impacted and concerned citizen testifiers, Assembly members voted to reject one item in the Mayor’s proposal, then approved his other weakening changes. The single change offered by Assembly member Tim Beck was approved by the Assembly: to reinstate wood over 20% moisture content on the prohibited fuels list. The prohibited fuels list includes treated lumber, plywood, plastic, rubber, and animal carcasses (aka dead goats). [Burning anything on this list is a nuisance “by proxy”, according to borough attorney Rene Broker.] A single Assembly member voted against restoring wet wood to the prohibited fuels list: Michael Dukes mdukes@co.fairbanks.ak.us. The justification given for approving the weakened clean air code which removed safeguards prohibiting woodsmoke over 50% opacity and against heavy plumes of smoke crossing property lines was these changes were “required” by Proposition A: the Home Heating Protection Act. A single Assembly member voted against the Mayor’s proposal because it removed safeguards needed to reduce smoke problems in our community and weakens local control, Diane Hutchison dhutchison@co.fairbanks.ak.us. Thank you, Diane! The decision of the Assembly to retain wet wood on the prohibited fuels list deserves community-wide commendation as it will help us all breathe a little easier. Please send a note of appreciation to our FNSB Assembly members to build on the momemtum of public testimony and encourage positive next steps for clean air in our community assembly@co.fairbanks.ak.us. Many individuals testified that Prop A does not “require” the deletion of clean air safeguards and pleaded with their stories of how smoke has harmed their health and property interests. Their heartfelt, personal stories described smoke harms within school classrooms, inside personal vehicles on public roads, and inside the walls of their own homes. The growing unmet need for clean air in our neighborhoods and schools will continue to push leaders in our community to recognize the need for action against wood and coal smoke at every level, from personal, city, borough, state, and federal. Clean Air Fairbanks was proud of our community for standing up for the need for clean air for children, families, employees, and the future strength of our economy. It is not easy to testify; the individuals who testified spoke for many residents impacted by smoke and hurting for solutions in our community. We’ll be there at your side for you: cleanairfairbanks@gmail.com. Published as FDNM letter to the editor “Protect the air” 1/26/2011. In the Sunday editorial, you stated that the wood stove initiative voters passed in October “was not only a policy disaster but also a grammatical disaster.” I would take it one step further and point out that many voters were confounded by it. I am a precinct worker and personally dealt with angry voters who felt the initiative did not say what they had been told it said. All I could do was tell them to read and reread it. Many asked if it was deliberately vague and/or misleading. At the beginning of the day, I was sure I understood it. After having to handle dozens of angry voters, I began to wonder if I had misread the initiative. You state that “the borough cannot ignore what the voters said last year, regardless of the consequences.” Really? Regardless of the consequences? This initiative states and does nothing. It is an insipid attempt to protect blatant polluters and their strident defenders at the expense of the entire community. I fear many voters did not understand what they were voting for. Only a referendum can repeal code. This was not a referendum but an initiative. Look at the title. The Borough has the power to set and enforce air quality and to protect the health and safety of residents. To do anything less is a travesty. I urge anyone concerned about the poor air quality in this community to attend the Borough Assembly meeting Thursday and challenge the Assembly to have the courage to protect the health and safety of all residents. This is it: speak to the Assembly and insist they resist pressure to gut our clean air code. As far as we know, this will be the final hearing. If you want clean air, show up and testify because this is the time and the place to bring down the smoke. Time: Assembly meeting starts @ 6 pm. Testimony starts @ 7 pm. Be prepared to go late. Place: Borough Chambers, 809 Pioneer Road, Fairbanks. The Assembly will hold a public hearing Thurday, January 27, 2011 to hear public testimony on Mayor Luke Hopkin’s major revisions of Borough ordinance to control fine particulate or PM 2.5 pollution. The Assembly is deciding on the Mayor’s proposed changes, 2011-03, draft version 1/13/2011, to the current Air Quality Ordinance 2010-28. Review the Agenda and the Jan. 27 Agenda Packet. Testify (3 minute limit) for retaining our current clean air code and strengthening it. Borough Assembly members need to hear from concerned citizens that we need their best efforts to solve our smoke pollution problem. Tell your story of your own experience because no one knows the trouble you’ve had with smoke like you do. Keep it respectful and civil. Whether or not you plan to attend, please email comments to all nine Assembly members at assembly@co.fairbanks.ak.us and Mayor Luke Hopkins mayor@fnsb.us. Please CC your comments to cleanairfairbanks@gmail.com. Also, submit your comments to the Fairbanks Daily News-Miner as a letter to the editor. The removal of wet wood is NOT REQUIRED BY PROP A. Keep wet wood on the prohibited fuels list. Keep our clean air safeguards: woodsmoke opacity and protection from dense trespassing smoke. Prohibit “improper or injurious misuse” of heating appliances and define the term to 1) include burning items on the prohibited fuels list, 2) violating a manufacturer’s recommendations, or 3) misuse that causes injury to public health or welfare. Strengthen the prohibited fuels list by adding 1) contaminated wood pallets, 2) any material not intended by a manufacturer for use as a fuel in a heating appliance, and 3) Any other materials that when combusted generate noxious, poisonous, or injurious fumes. Please read the Borough attorney’s legal opinion and share it with the public. Not tackling the smoke problem will cost us countless local jobs and lower property values. Enforceable provisions in the clean air code empower residents to defend their health and property assets through the judicial system. If efforts fail to curtail excessive smoke caused by misuse, all use of wood for heat may be restricted to meet attainment. Our serious nonattainment status requires serious measures to protect our public health and economic security. Nearly 75% of our PM 2.5 is from woodsmoke. Coal burned in neighborhoods contributes as well. Dozens of exceedences of the 35 microgram/cubic meter federal “health-based” standard occur each winter. The Borough has received hundreds of complaints from residents; the number increases each year. Since 2007, PM 2.5 levels have climbed year after year. In 2009, a reduction of 20% in ambient levels would have been necessary to meet federal standards. On ordinary winter bad air days, Fairbanks has the highest fine particulate pollution in the nation. No fines or tickets for smoke pollution have been issued; state and local agencies have never even found a violation. Smoke has found our community unprepared, harming the health of our children and endangering the economic security of our community. The current local Air Quality Ordinance 2010-28 (approved 6/10/2010) permits the burning of coal in unregulated appliances in neighborhoods and sets a minimal $30 fine for violation of the woodsmoke opacity safeguard. Fearing a loss of individual “civil rights,” some in our community gathered signatures for a citizen’s initiative. Called Proposition A: the Home Heating Protection Act, voters passed the initiative Oct. 5, 2010, and it was certified Oct. 12. Prop A as written applies only to the “use” of home heating devices: “The borough shall not ban, prohibit, or fine residents for the use of home heating devices.” Prop A should have been incorporated into local code as written, per state law in October of 2010. Instead, changes to weaken the clean air code have been proposed by Mayor Hopkins, 2011-03, draft version 1/13/2011. Without citing any written legal opinion or precedent, Borough attorney Rene Broker declared Prop A requires “nullification” of the woodsmoke opacity safeguard and protection from dense trespassing smoke. We’re skeptical. As an initiative, Prop A has no power to repeal, per Article 11.1 of the Alaska Constitution. Also, nothing in Prop A says repeal the two safeguards. We’ve requested the attorney’s legal opinion on this important consideration and have asked that it be also made available to Assembly members before any decision is made. The legal interpretation of Prop A must be quite specific indeed to enable such deft cuts while leaving other sections such as prohibited fuels intact. Even so, the prohibited fuels list is being trimmed, removing wood with more than 20% moisture content and “glossy or colored papers.” Why? Recently Attorney Broker disclosed changes to the prohibited fuels list are not required by Prop A. But then why would the Mayor eliminate wet wood from the prohibited fuels list? The administration says they are “too difficult to enforce.” As wet wood is the chief culprit in creating our smoke problem, a good amount of effort appears worthwhile. The loss of Federal highway (and ferry) dollars and all those jobs, 2 to 1 offsets for point source permits or modifications, and jeopardizing Eielson Air Force Base through the 2013 BRAC process and all those jobs too. Fewer jobs means lower property values and lower consumer demand and a downward spiral of even fewer jobs. The consequences an inadequate PM 2.5 pollution ordinance are grave for public health and the economic future of our community. No one who has supported the gutted ordinance believes it will bring down our PM 2.5 enough to meet attainment. So why do it! The Assembly is bound by state law AS 29.26.190(a) not to amend or negate the “effect” of a citizens’ initiative for two years. However, the Assembly retains sole and unfettered authority to establish any local air quality control program and enforce air pollution control with penalties as they see fit, see Alaska Statutes 29.35.055, FNSB codes 1.02.020 A.7. and 1.02.040 A.3., and the Oct. 2009 voter-approved Prop B which affirmed authority for the local PM 2.5 program. It is a mistake to assume the State will step in with an unprecedented level of engagement and take care of our nonattainment problem for us. Even if the State does step up, our air troubles have grown too big for the state to solve without our help. The proposed ordinance is an unnecessary and harmful abdication of local control. Prop A as written applies only to the “use” of home heating devices: “The borough shall not ban, prohibit, or fine residents for the use of home heating devices.” A very different initiative was not considered by voters; we call it Prop X: The borough shall not ban, prohibit, or fine residents for the use or misuse of home heating devices. Prop A cannot be misconstrued to have the same “effect” as Prop X. For the Assembly to prohibit improper or injurious misuse does not touch the “effect” of Prop A. The Mayor’s draft could be reasonably seen as negating the “effect” of Prop A as it ignores the ballot language of the initiative entirely! Prop A should have already gone into local code Oct. 12, 2010, the date the election was certified, per AS 29.26.170(d). As written, Prop A causes far less harm than the gutted Clean Air Ordinance proposed by the Mayor and the Air Pollution Control Commission, 2011-03, draft version 1/13/2011. Recent studies have found increased mortality with short-term exposure to PM 2.5 concentrations less than 20 μg/m3, considerably below the “health-based” 24-hour standard of 35 μg/m3. Review earlier post: Health Impacts from PM 2.5 Particle Pollution. Review our recommended amendments package on how we can keep local control by prohibiting “misuse” of heating appliances in this earlier post: Recommended Amendment Package on 2011-03. 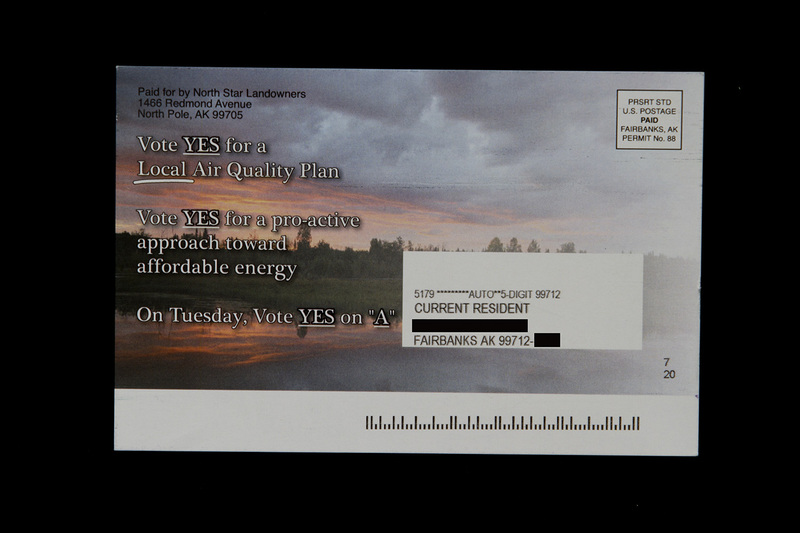 Quite a fuss was generated over Clean Air Fairbanks’ amendment proposal. First, FDNM editorial published “Stove rules out: It’s tempting, but not right, to ignore October initiative” 1/23/2011. Then, we submitted a Community Perspective in response (read text below). Finally, Mayor Luke Hopkins submitted is own response, “Air quality initiative is law” 1/27/2011. The day our Community Perspective was published, our Air Quality Index again reported smoke made Fairbanks’ air UNHEALTHY FOR SENSITIVE GROUPS. The mayor and Assembly have made clear: a written legal opinion has not been received from legal staff. Read our Community Perspective, published by FDNM 1/26/2011 and comment below if you like. Thank you for writing about Mayor Luke Hopkin’s proposal for our clean air ordinance, transforming air pollution control into a largely voluntary program. On Thursday, the Assembly will consider testimony on whether to dump safeguards to reduce smoke pollution. Our recommendation is that people start with an honest look at what Proposition A actually says, what it does not say, and what it cannot say. Ours is a literal or strict interpretation of Prop A.
We’ve made every effort to promote transparency in a process sadly lacking. Our amendment package is posted on our website and was sent to the Assembly and the Mayor. Our recommendations relate to “improper or injurious misuse,” leaving the “effect” of Proposition A intact, and thus comply with Alaska Statute AS 29.26.190 (a). Furthermore, we flat out recommend that the Assembly pass a resolution acknowledging the voters’ authority to establish Prop A as Borough code, per AS 29.26.170 (d). I would never ignore Prop A. Calling for the voter-approved initiative to be codified as written is the essence of public accountability. Sneaky is happening, that is true. You could have seen it yourself at the Jan. 20 Assembly’s Committee of the Whole. I was there and watched it unfold. The Mayor is also recommending removing glossy or colored papers from the prohibited fuels list, also not due to Prop A. Reason for these changes? Prohibiting burning wet wood and glossy or colored paper is “too difficult to enforce.” Even the reason is sneaky. The prohibition against burning wet wood wasn’t to have taken effect until Sept. 1, 2011. How can our Borough know when they’ve never even tried? When we reread the language of Prop, we see no stipulation to remove the woodsmoke opacity or trespassing smoke safeguards. If repealing was intended, the Alaska Constitution, Article 11.1 gives that power solely to the referendum. The initiative may only enact law. Voter intent is best revealed by the initiative language itself, what voters approved. Any conclusion that Prop A may function as a referendum in repealing code is not grounded in our Constitution. The third big sneak is, the way things are going, Prop A will not be enshrined in code. Whether I care for it or not, as a voter-approved initiative, Prop A is required to be dropped directly into code on the date the election was certified, Oct. 12, 2010, over three months ago. The Mayor’s draft fails to accept the voter-approved initiative into code as required and proposes something far more injurious than Prop A: the removal of safeguards against smoke pollution. Justification for the gutting is given unequivocally but without substantiation as “justified by Proposition A.” Then, it removes wet wood—the #1 culprit in our PM 2.5 pollution— from the prohibited fuels list, gutting the clean air code without reasonable explanation and beyond the call of Prop A. Now, who is being sneaky here? This I do not know. I trust and believe in our mayor at least as much anyone in our Borough. Perhaps it is time to seek a second legal opinion, or at least a first. Our smoke problem is too severe and the economic costs of nonattainment too high to throw out public health and property rights safeguards without full legal review. The need for transparency in public decisionmaking and love of our children’s future demand it. Sylvia Schultz of Fairbanks contributes to Clean Air Fairbanks, a blog that explores issues surrounding airborne particulate matter in Fairbanks and advocates for better air quality. She is the mother of two elementary school-age children. During a public meeting of the Fairbanks North Star Assembly on Jan. 20, 2011, Borough attorney Rene Broker explained Prop A requires the nullification of certain sections of our current Air Quality Ordinance 2010-28 but not others. The gutted Air Quality Ordinance, 2011-03, draft version 1/13/2011, as proposed by Mayor Luke Hopkins, includes weakening changes not required by Prop A. We find this explanation remarkable given that Proposition A: the Home Heating Protection Act stipulates nothing of the sort. Only a referendum can repeal code, and the borough attorney states that Prop A is not a referendum, but an initiative. Yet, the attorney is reading into Prop A meanings with ZERO substantiation. What’s behind the curtain forcing (some of) the weakening of local protections for our air? We have asked our Assembly members to make public Attorney Broker’s written legal opinion that supports and justifies (including with court precedent) the sweeping changes she says are driven by Prop A. We don’t really have strong feelings about glossy paper. It probably isn’t a big deal if a newspaper grocery insert happens to go into a woodstove. Yet, by all reasonable estimations, the burning of wet wood is the chief culprit of our smoke problem, including both acute neighborhood nuisances and federal nonattainment. So, the illogical of how Prop A is being applied to gut our Air Quality Ordinance now stands revealed. Furthermore, the Mayor’s betrayal kicks a dog when it’s down. We like the Mayor as much as anyone, but when our attorney and mayor are lining up to gut protections for our air, you deserve to know their justifications. Clean Air Fairbanks has researched what other communities shrouded in woodsmoke have done. The comparison is difficult as our PM 2.5 pollution peaks far higher and coal is prohibited. But you can be sure that in Bakersfield CA, (the supposed #1 most polluted city for short-term particulate pollution) prohibits wet wood because that’s a chief culprit. Refer to previous post: Highest Fine Particulate Pollution in the Nation. While we may not care how they do it Outside, failing to take all reasonable measures to clean our own air brings with it public health and economic consequences. Using unsupported, illogical explanations and copping out on prohibiting wet wood, guts needed protections for our air and defies the public interest in the future of our community. Here’s the section by section breakdown presented by Borough staff Jan. 20 on why 2011-03, draft version 1/13/2011 is “necessary” to gut current Air Quality Ordinance 2010-28. Clean Air Fairbanks submitted a package of three recommended amendments and a resolution to the Assembly for consideration, as well as options to consider during discussions. You may read and download the package [includes updates] here: as a Word DOC [145KB] or as a PDF [245KB]. These amendments may be considered during an Assembly work session to be held Thursday, Jan. 20, 2011 sometime after 5 pm in the Borough building, 809 Pioneer Road, Fairbanks. Work sessions are public, but testimony is not taken. On January 27, 2011, the Fairbanks North Star Borough will be considering and very possibly voting on the gutted Air Quality Ordinance, 2011-03, draft version 1/13/2011. Mayor Luke Hopkins Mayor proposed changes to the current local Air Quality Ordinance 2010-28 to accomodate Proposition A: the Home Heating Protection Act. Prop A, approved by voters in Oct. 2010, is being used to justify these weakening changes to current ordinance. In the recommended amendment package, Clean Air Fairbanks offers a fresh read of Prop A based on what it actually says. With that fresh read, Clean Air Fairbanks found a way forward to call on the Assembly to prohibit and define “improper or injurious misuse” of a heating appliance, add to the list of items that should never be burned in a heating appliance, and to incorporate the Mayor’s minor adjustments to the term “pellet stove” and deletion of the word “used.” Clean Air Fairbanks identified the Assembly’s authority to establish and enforce air pollution control and requested that the Assembly pursue effective control of PM 2.5 pollution. Public support for the recommended amendment package is essential. Residents affected by the highest smoke levels in the nation need to join efforts to call on the Assembly to cut the smoke. See earlier post: “Few show up…” Let’s Not Let This Happen Again!